NEW YORK (AP) –Aaron Rodgers and the Green Bay Packers not only ended the New England Patriots’ seven-game winning streak, they also replaced them as the top team in the NFL. The Packers beat the Patriots 26-21 on Sunday in a matchup of two of the NFL’s best. 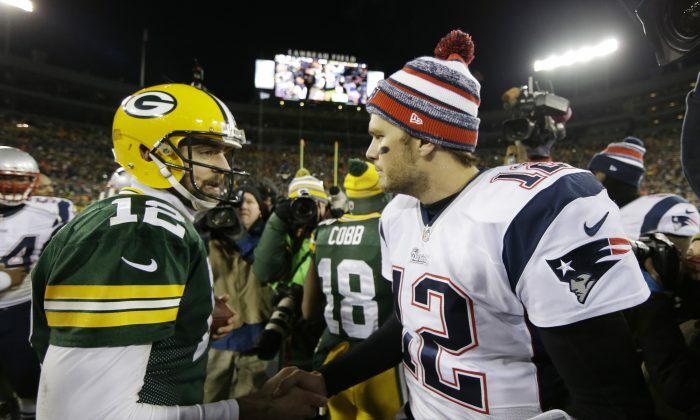 “Chapter 1 of the long-awaited Aaron Rodgers-Tom Brady duel goes to Rodgers in a thriller at Lambeau,” Newsday’s Bob Glauber said. The Packers (9-3) received 11 of 12 first-place votes Tuesday in the AP Pro32 power rankings, which are decided by a media panel that regularly covers the league. “Facing Aaron Rodgers at Lambeau just doesn’t seem fair to opposing defenses,” Ira Kaufman of the Tampa Tribune said. The Patriots (9-3) got the other first-place vote. New England will look for its 10th win with another tough road game, facing the San Diego Chargers on Sunday night. “Last Sunday’s close loss to Green Bay did nothing to hurt New England’s standing as the AFC’s best team,” Foxsports.com’s Alex Marvez said. The Chargers (8-4) jumped from No. 17 to 11 after rallying past the Baltimore Ravens 34-33 on Sunday. “A huge win over Baltimore keeps San Diego in the playoff conversation,” ESPN’s Herm Edwards said. The Denver Broncos (9-3) stayed at No. 3 after beating the Kansas City Chiefs 29-16 on Sunday night. “Broncos showing balance on offense; solid defense,” Fox Sports’ John Czarnecki said. The Philadelphia Eagles (9-3) and the Seattle Seahawks (8-4) moved to Nos. 4 and 5. The Seahawks climbed from No. 7 after their 19-3 win over the San Francisco 49ers on Thanksgiving. “Impressive vs. SF, but tough December schedule,” NBC Sports’ Tony Dungy said. The Indianapolis Colts (8-4), Arizona Cardinals (9-3), Detroit Lions (8-4), Cincinnati Bengals (8-3-1) and Dallas Cowboys (8-4) rounded out the top 10. The Cardinals have dropped two straight, and their lead in the NFC West has been cut to a game. “The Cardinals have scored one offensive touchdown during their current two-game losing streak,” said Rick Gosselin of The Dallas Morning News. The Eagles beat the Cowboys 33-10 on Thanksgiving to grab first place in the NFC East. The teams play again Dec. 14. The Cowboys dropped from fifth to No. 10 after the loss. The Oakland Raiders (1-11) dropped back to No. 32 after being routed 52-0 by the St. Louis Rams. “That’s no way to celebrate your first victory of the season,” Kaufman said.